Adsorption humidity effects, microparticle rate behavior, and thermal swing adsorption is a good Chemical engineering project. A study of coadsorption of water and immiscible organics is also shown. Data for the system chloroethane water on two activated carbons is measured. A new coadsorption model is developed to describe immiscible vapors and water. You can also Subscribe to FINAL YEAR PROJECT'S by Email for more such Chemical projects and seminar. The use of thermal swing adsorption for air purification is examined in this project. An experimental system is used to perform cycling experiments under dry and humid conditions. A dynamic simulation model is developed to describe several of cycling runs. Using the coadsorption model developed above the good agreement is found between the data and simulation profiles. Optimization of cycle parameters was investigated to show that some moderation of the feed water content is required to obtain high purification of a light vapor challenge at ambient temperature conditions. 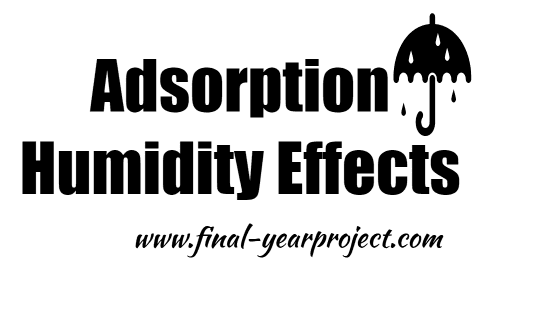 The internal rate effects of commercial adsorbents have been reported in the literature. There is seldom an attempt to review the many approaches. Data was calculated using a gravimetric method for chloroethane and hexane on BPL activated carbon and 13X molecular sieve. A distributed parameter micropore diffusion model was solved to simulate this data. Also in this project, regression of the adsorption and desorption data was used to calculate micropore diffusion coefficients. These values were shown to compare well with literature values. Use this project for your reference and study work. Thanks to the author of the project.